Throughout 2017, Eurovision Union was dedicated in bringing you Weekly Playlists with new music from Eurovision and National Final stars, new and old, as well as stars we’d love to see at Eurovision one day! We made so many musical discoveries, and through 2018, we want to share with you which songs we’ve been loving! Some songs will come and go, and some will stick around – here are our Eurovision Union Chart Toppers! If you enter my mind, you will find that this song is in my head quite a lot. Capo Plaza is having a moment on the Italian charts, and I’ve hopped straight on board with this one. I enjoy the melody and the overall sound of this song, and that’s why it’s hanging onto its first place position. This might be a hit or miss for some, but if you loved Blanche’s Eurovision entry, you will be bound to love this new track from the young Belgian artist. I love that this song is both simple but complex, and towards the end feels quite chaotic. It’s an interesting sound, and I’m enjoying it. This has been a bit of a slow burn, but after a fair few listens it’s safe to say it’s become one of many earworms that pops up all the time. It has such a catchy melody that is easy to sing along with, making it perfect for car karaoke! This isn’t a new track, but it’s new to me and boy is it completely addictive. It has that popular Latino feel to it with the signature Swedish quality, and like many Swedish tunes, the choruses really are intensely catchy. After searching through old playlists for some fresh music inspiration, I came across this old beauty from one of my personal favourites, Benjamin Ingrosso. It’s very Justin Bieber-esque, but sometimes you just want a bit of cheesy pop. I’m still very much on the Joci Pápai train, especially with this song. It’s not his latest single, but for me it’s one of his best, up there with his Eurovision entry Origo. I love the ethnic charm of this song, and the melody certainly impresses. This track isn’t the most revolutionary when it comes to pop oriented rap, and it wasn’t love at first listen but this is a big grower. Once again it’s a catchy Latino inspired track as the name suggests, and songs like this tend to go down well with me! This is such a great song for car karaoke, especially when it’s turned up nice and loud. Although I still wouldn’t have picked it as my Eurovision winner, I’ve come to appreciate the creativeness and uniqueness of this song! Again this was a rediscovery from older playlists, but this track voiced by former Icelandic Eurovision participant Svala is truly magnificent. From the melody to the music, everything about this song is honestly perfect. So happy to have remembered this! The second ex-FO&O on our Chart Toppers this week, and this track really is fresh. Another top quality Swedish track, it was inevitable that this song would become an instant hit. It was the perfect solo debut, and I can’t wait to see what else is in store! Basim has been on the backburner a bit this time around, with this being the most listened to lately from his collection. It’s his newest track so it’s still fresh to me, and I’m definitely enjoying the vibe of this song. It’s still got that Middle Eastern feel, but not as much as some of his previous releases. It has been a HOT MINUTE since we listened to this track, but after revisiting old playlists, I remember how much of a gem this track is from the young Bulgarian star Kristian Kostov. If he continues to release tracks like this, he will have a very bright future ahead of him! This track is unlike most of the others in this Chart Toppers, but the stripped back nature of this song is very refreshing. It really highlights the lyrics of the song, whilst still feeling very much like an Alexander Rybak track with the beautiful sound of the violin. What. A. Voice! Any track that Aleksander adds his voice to is instantly a hit with me, and although this track isn’t new, it’s come back into rotation and I’m seriously loving it! It’s got a great melody, and a fantastic voice to back it up. This has been hanging around in our Chart Toppers for a long time now, and although it’s dropped a few places over the last few weeks, it’s still a personal favourite! 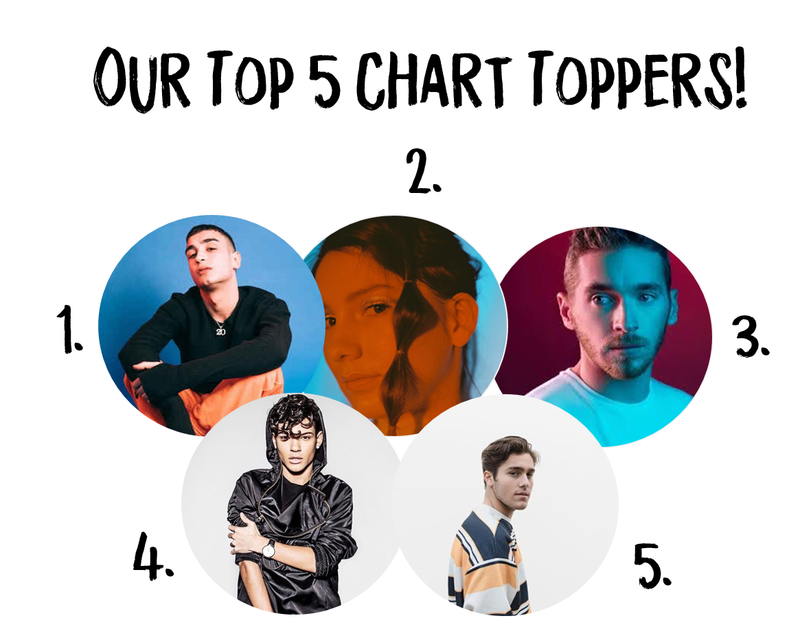 Lost but not forgotten are the handful of Basim tracks that have been a huge part of my playlists and Chart Toppers for the majority of this year. Although not at the heights they once were in our Chart Toppers, I’m still enjoying the occasional listen of his tracks! This one of Basim’s most popular tracks on Spotify and it’s easy to see why. Although it’s fallen in our Chart Toppers, it’s still one of my all-time favourites! Another fantastic song that falls in the same category as those above! Another ethno tune that we love to love is Origo, ie the Hungarian Eurovision entry from 2017. This is a really great song, and it’s good to have it in rotation! Who will represent Sweden at Eurovision 2019? Here’s the Latest! Italy Confirms Sanremo date, but no confirmation for Eurovision yet!